There’s nothing more romantic than a warm, inviting hot tub while you’re enjoying a holiday with your loved one. From quaint log cabins nestled in the beautiful English countryside to grand cottages near bustling towns, there’s plenty of options to choose from. Cottages with hot tubs are perfect for a romantic break whatever the season – from unwinding after a day at the beach with a glass of champagne to admiring frosty landscapes from the comfort of your tub. With so much to choose from it can be hard to know where to start, so to make it easier for you we’ve compiled a list of our favourite cottages in the UK. 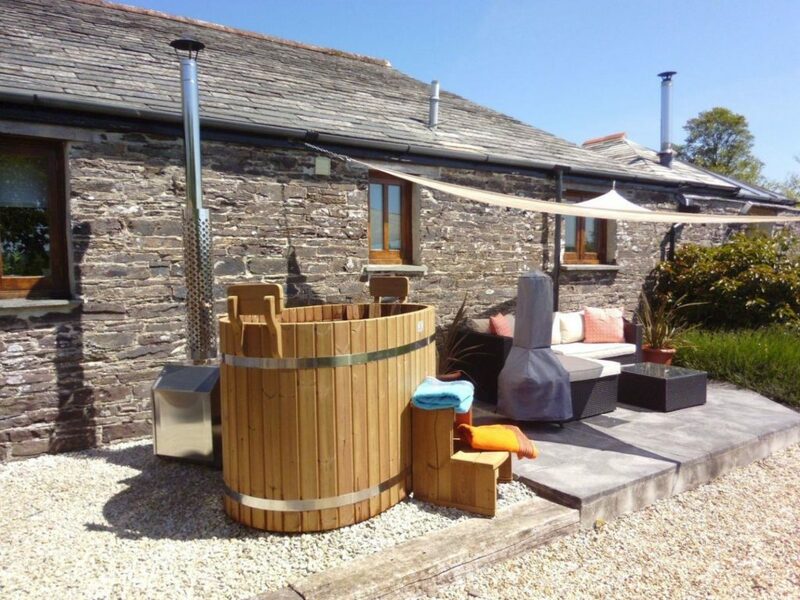 If you’re looking to book a holiday in the near future, check out our last minute cottages with hot tubs. 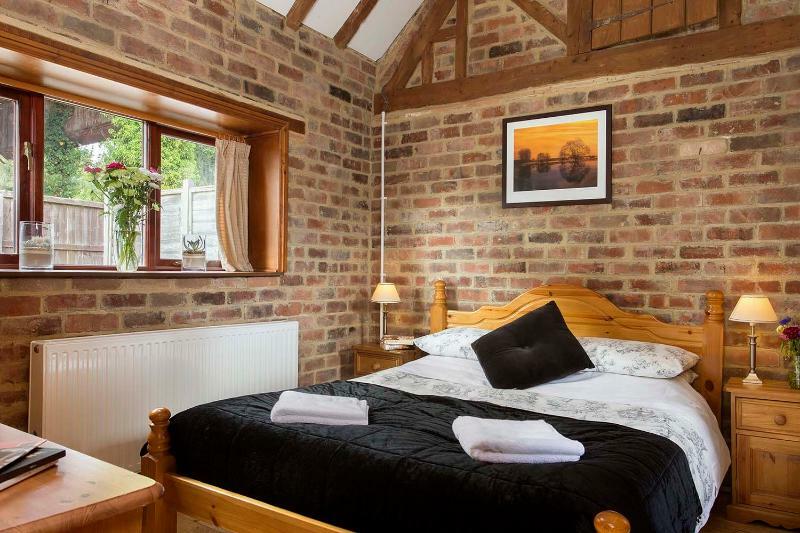 This lovely barn conversion in Warwickshire is well furnished and boasts original brick work and warm oak wood floors. It’s a cosy hideaway perfectly suited to a romantic break. Plus, after a day of sightseeing you’ll be able to relax in your very own hot tub during your stay. It’s close to the famous town of Stratford-upon-Avon, the birthplace of William Shakespeare, which boasts some of the best day trip activities in the whole of the UK. You can expect lots of Shakespeare-related activities, including the Royal Shakespeare Theatre, as well as beautiful scenery along the Stratford-upon-Avon canal. Best for: You can’t visit Stratford-upon-Avon and not learn more about Britain’s most celebrated author, so make sure to visit Shakespeare’s birthplace, where there’s an amazing museum. If you do one thing For a night of amazing, unforgettable Shakespearean fun, you should make sure to get tickets for a show at The Royal Shakespeare Theatre. Where to eat: Experience some traditional British fare at 33 The Scullery. The family run business prides itself on creating a warm, friendly atmosphere which is ideal for a romantic break and offers a classic, fresh and seasonally-inspired menu. Sandwiched between Bodmin and the north Cornwall coast, this cottage is perfect for a romantic getaway. You’ll be able to enjoy a Japanese-style, wood-fired hot tub, cosy interiors and an epic king sized bed. This relaxing cottage is in the quaint village of St. Kew, which has a number of local pubs and shops. If you’re looking for something a little more lively, however, you’re only a 7-minute drive from Wadebridge, where you’ll find amazing country houses, epic beaches and lots of of great restaurants. 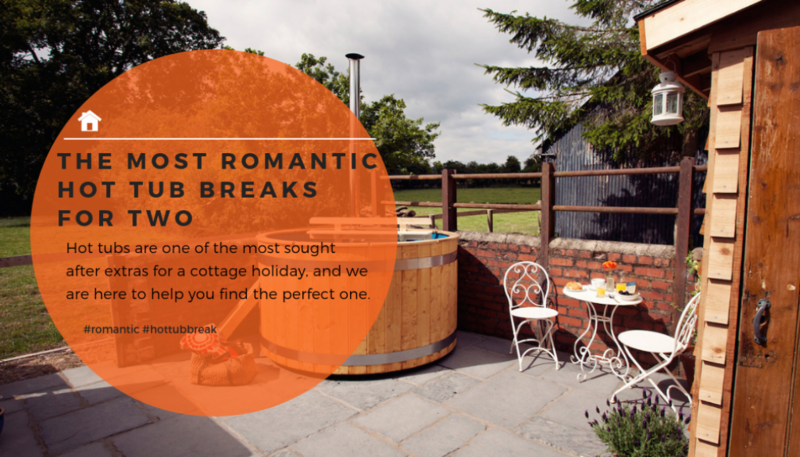 Best for: This holiday cottage is perfect for couples looking to explore the best of the British countryside before relaxing in the hot tub. We’d recommend Daymer Bay Beach and Rock Beach. If you do one thing: Be sure to head into Wadebridge and visit the Donkey Trail, a long, winding country footpath where you can soak up some of the best sights the UK has to offer. Where to eat: Nestled amongst the rolling hills of the Cornish countryside with epic sea views, The Pickwick is one of the county’s best hidden gems. With fresh fish and locally sourced meat, there restaurant offers casual dining in a relaxed, romantic atmosphere. Small but perfectly formed, we love this shepherd’s hut. It’s a cosy place to stay and has all the essentials you’ll need for your romantic trip away. 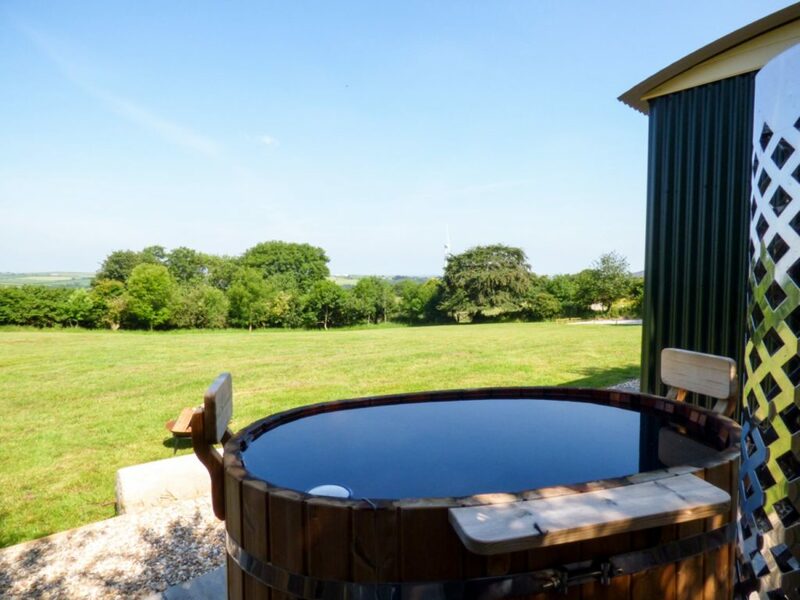 Set within 410 acres of farmland, you’ll be able to enjoy amazing views while relaxing in the outdoor hot tub. Located in between Bodmin and Wadebridge, the property is surrounded by amazing areas of outstanding natural beauty, perfect for long walks and amazing views. It’s also close to lots of great landmarks, including the ancient ruins of Trethevy Quoit and the Cheesewring. Best for: There’s no doubt about it, this quaint, cosy cottage is perfectly placed for enjoying Britain’s great outdoors. With loads of amazing hikes, trials and public footpaths surrounding the property, we’d recommend packing your walking boots! 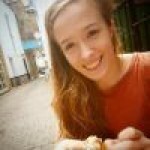 If you do one thing: The old Bodmin Jail is a must-visit attraction. It’s one of the oldest in the country and is said to be one of the most haunted buildings in the UK. Spooky! Where to eat: Make sure to book a table at the Lanivet Inn. It’s a community-led pub in the heart of the picturesque Lanivet village, just outside Bodmin . With locally sourced produce, an amazing selection of local brews, as well as board games and local music – it’s not one to be missed. Nestled in Cumbria, less than an hour from the Lake District, this cottage is the perfect size for two. It benefits from lots of handy extras such as parking, an open planning living area and, of course, a hot tub. There is plenty of space to relax outside here with loads of nature parks right on the doorstep, plus it’s close to lots of great attractions. 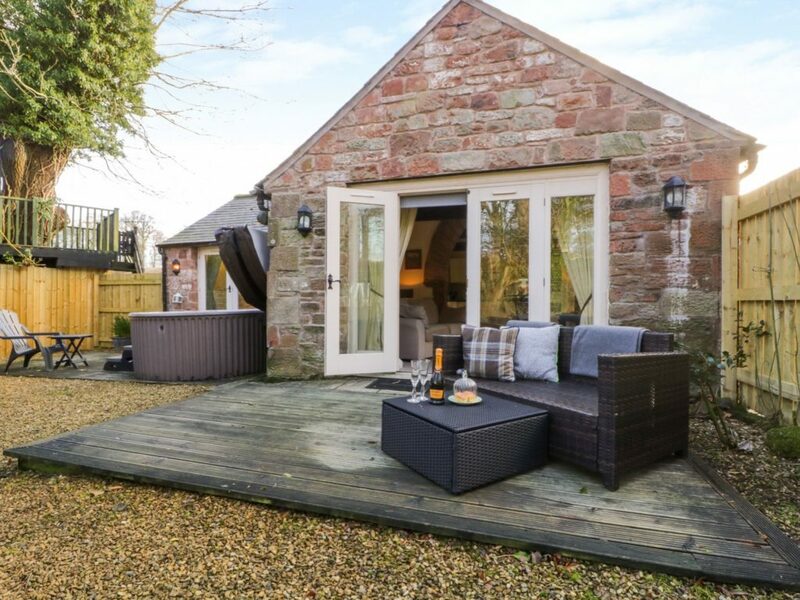 It’s close to the village of Longtown and is just 26 km from the historic city of Carlisle, where you’ll find an amazing cathedral, boutique shops and even a castle. It’s also home to Hadrian’s wall, one of the country’s best-loved landmarks. Best for: The historic city of Carlisle is a must see destination if you’re interested in British history. It’s home to some of the finest museums, cathedrals and galleries in the country. If you do one thing: Hadrian’s Wall is a top attraction in this part of the country, and you don’t have to be a history-buff to enjoy it. It offers some of the best views in the whole of the UK and there’s lots of guided tours on offer. Where to eat: We’d recommend heading to Assembly while you’re in Carlisle. The modern British restaurant is perfect for a romantic evening. Expect local produce, seasonal ingredients and British classics with a twist! Only a short distance from the Essex seaside, this romantic cottage is ideal for a couple’s getaway. The local village has a farm shop and a pub, and the cottage offers a hot tub and a patio with a BBQ and garden furniture. Plus, the cosy living room is perfect for snuggling up on the sofa and enjoying a glass of wine or two. With some of the most amazing beaches to be found on the East Coast, why not get yourself down to this delightful cottage and start exploring this hidden gem of a seaside. Just 15 minutes’ from Clacton-on-Sea there’s loads to explore here. Best for: With the amazing east coast literally on your doorstep, this is undoubtedly one of the best places in the UK for long walks along the coast. With epic views and great public paths, it’s perfect for outdoorsy couples. If you do one thing: Make sure to get down to Clacton Pier for some traditional ten-pin bowling, an arcade and proper old-fashioned rides. It’s the best of British seasides. Where to eat: Experience the taste of Italy while enjoying the English coast and get down to Franco’s in Clacton-on-Sea. It serves traditional Italian cuisine in a relaxed setting. This charming cottage in Gloucestershire is perfect for a romantic retreat. The hot tub offers stunning views over the surrounding countryside and there’s an LED lantern and bluetooth speaker too. It’s pet-friendly, so you can all enjoy a hot tub holiday together. In the heart of the Forest of Dean, this property is set within the beautiful English countryside and only 30 minutes’ drive from Gloucester. With access to one of the country’s best loved forests, this is not one to be missed. Best for: It’s not everyday you get the chance to explore the Forest of Dean, so make sure to bring your four legged friends and enjoy a weekend of long walks, birdwatching and nature trails. If you do one thing: Goodrich Castle is not to be missed. The Norman ruins overlook spectacular views of the British countryside and are perfect to soak up some classic UK history. What to eat: We’d recommend driving into Gloucester and heading to So Pie. It may not be the most romantic, but if you like proper British pies, then this has to be the one for you. Plus, after a long day of walking in the Forest of Dean, there’s no better way to replenish yourself than with a delicious pie and a pint! This cottage is in a beautiful location in Monmouthshire. Set on a farm and surrounded by rolling countryside, it’s a perfectly peaceful spot for two. 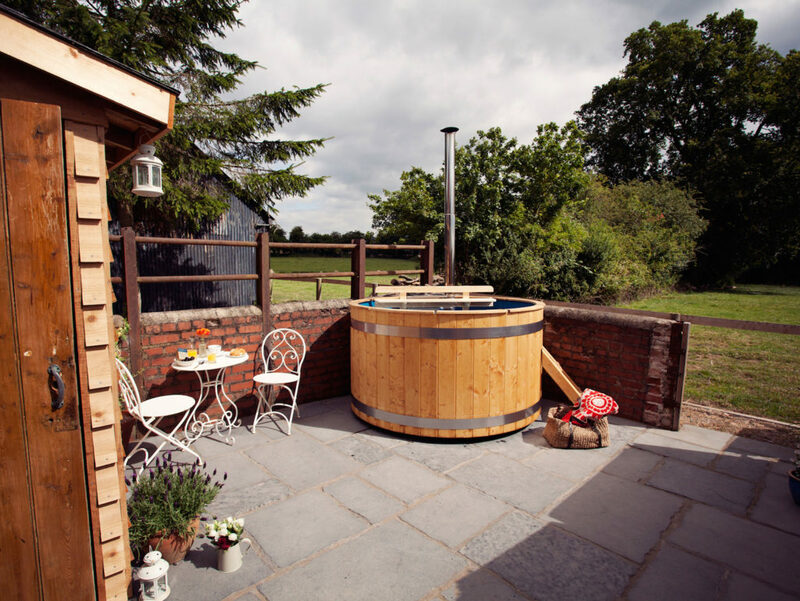 The cottage benefits from a private hot tub, bike storage and a breakfast hamper. It’s dog-friendly too! Located close to Brecon Beacons, as well as the historic town of Monmouth, there’s lots to explore from this cottage with your loved one and your favourite four-legged friend. Best for: On the edge of the Brecon Beacons National park, this cottage is perfectly situated for adventurous long walks in areas of outstanding natural beauty. If you do one thing: After walking through the epic countryside, it’s definitely worth heading to the charming historic town of Monmouth. It has an amazing castle, as well as one of the prettiest bridges to be found in the whole of the UK. What to eat: To really experience the local area, we’d recommend heading to The Stonemill. It’s set in an historic mill and serves some of the best roasts to be found in the county. Forget stuffy boutique hotels, this log cabin with hot tub is the perfect choice for a romantic break. With amazing views from the front door, this is just the place to reset your batteries. 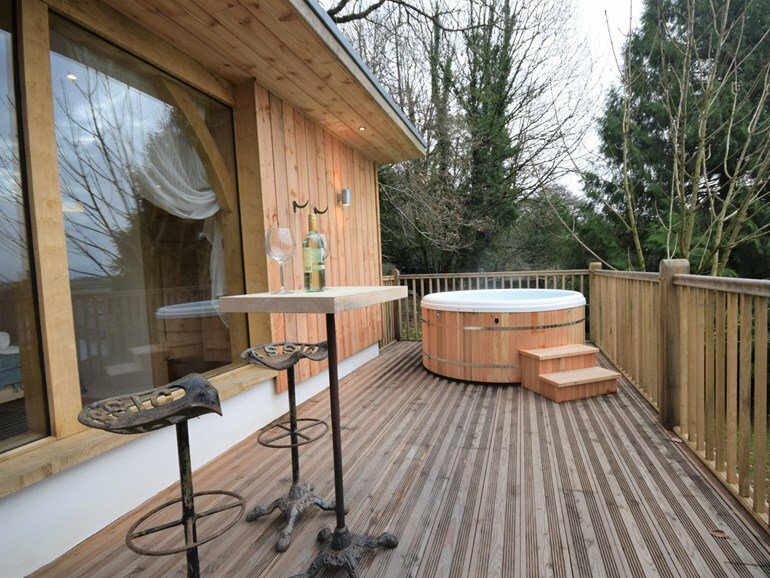 There is plenty of walking and cycling to enjoy nearby, and there is a private hot tub and BBQ for you to enjoy. 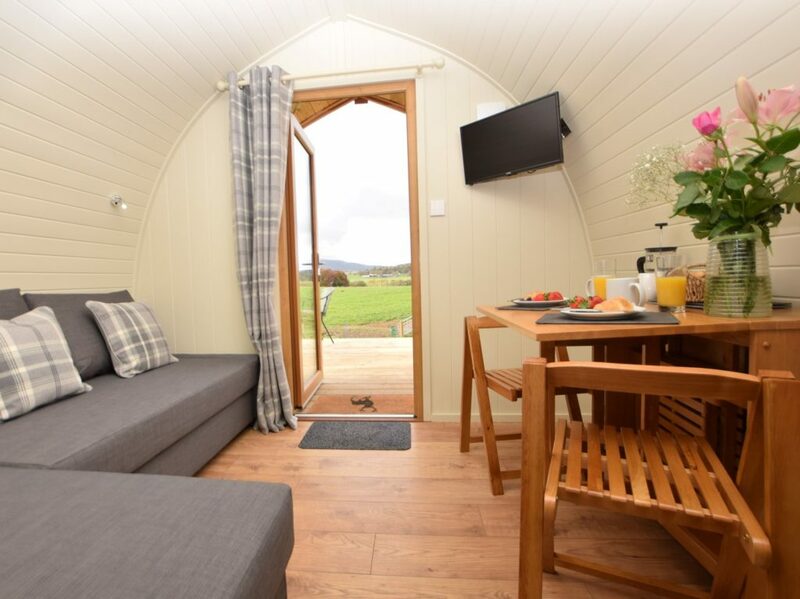 Under an hour from both Glasgow and Edinburgh, the cabin is nestled in the town of Biggar, a picturesque town in the rolling lowlands of Scotland. Close to several national parks, as well as cosy pubs, it’s a great spot for a weekend away for two. Best for: Biggar has a selection of great local pubs to explore during your stay, perfect to sit back and relax after a long day exploring the countryside. If you do one thing: Just 30 minutes’ drive from the cottage is the outstanding Pentland Hills Regional Park. With over nine peaks of 1,500 feet, it offers some of the best walking trails and views to be found in the country. What to eat: We particularly recommend The Crown Inn, a traditional English pub with picturesque countryside views. It offers classic British dishes in a relaxed atmosphere, perfect for a romantic night out with your partner. 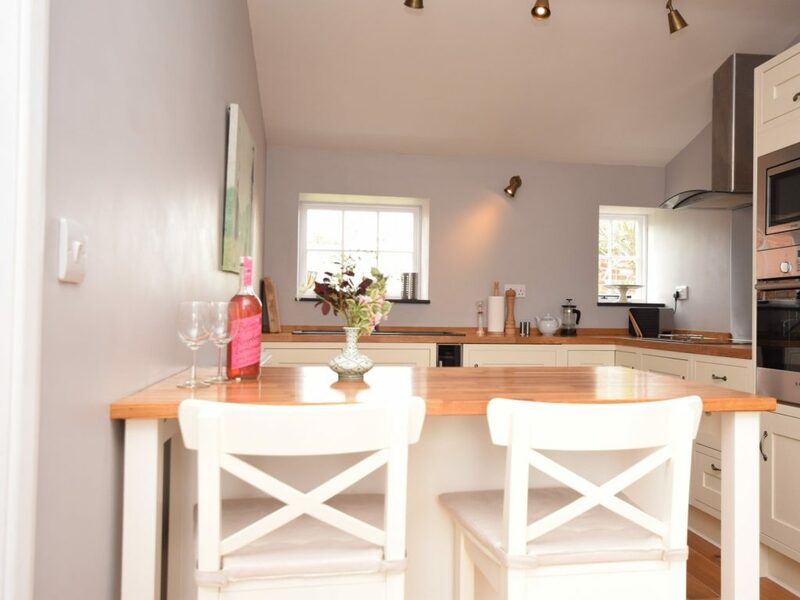 This lovely cottage in north Devon is a delightful place for a romantic break. Its open plan with exposed beams and wood flooring. Guests will be able to enjoy a king sized bed, free-standing copper bath, enclosed deck area and a private hot tub. Close to the main town in North Devon, Barnstaple, the cottage is surrounded by loads of great activities, including bike trails, museums and the River Taw. 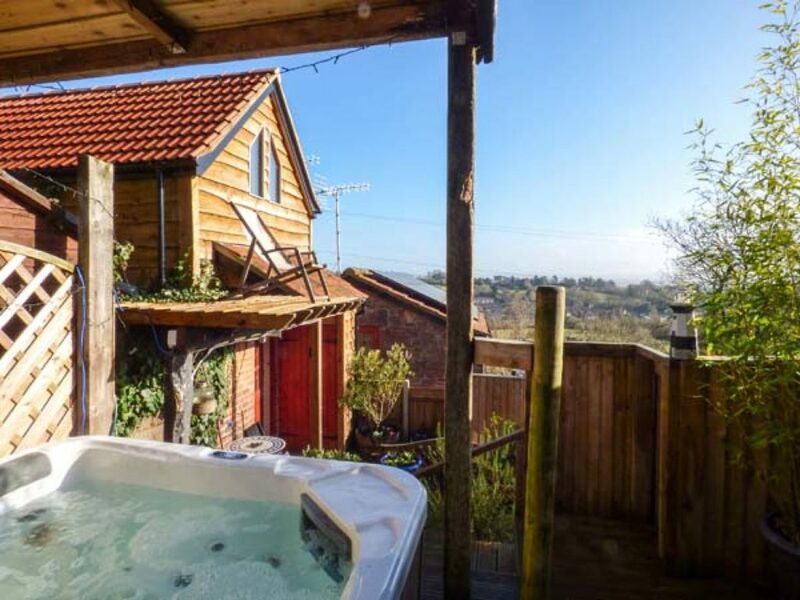 Best for: The amazing hot tub in this cottage should not be missed. Relax after a long day of exploring the countryside and take time some time to chill out with one another. If you do one thing: Get on your bikes and head to the Tarka Trail. It’s a series of amazing footpaths across the county which cannot be missed. What to eat: Experience the taste of India on your romantic weekend away and head to Everest Gurkha Chef. It’s a local favourite, and it’s easy to see why. Expect classic Indian dishes in a relaxed, informal atmosphere.